Have you ever clicked Send and instantly regretted it? Are you drowning in a flood of email or struggling with a bloated inbox? 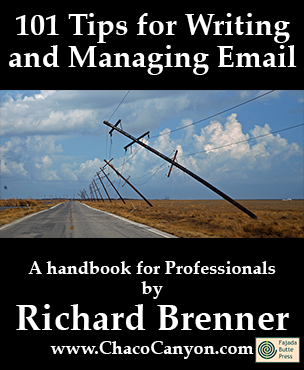 This practical handbook is packed with tips for writing more professional email, and managing more effectively the email you receive. There are ideas for managing your inbox, staying out of feuds, deciding how to delete messages, how to write subject lines, and much more. Have you ever clicked Send and instantly regretted it? Are you drowning in a flood of email or struggling with a bloated inbox? 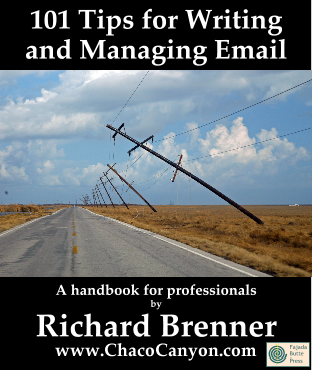 This practical handbook is packed with tips for writing more professional email, and managing more effectively the email you receive. Even without all the spam we receive, many of us are overloaded with email. How do we know that? Type "managing email" into Google, and you get over 261 million hits. Popular topic — 261 million is hard to match with any two-word business-oriented search phrase. Email has become a nightmare for most of us, but you can help restore it to the useful tool it once was. All you have to do is learn to write email that works, and learn to manage the email you receive. I had to deal with this same problem myself, so over the years I've figured out a whole array of tricks, techniques, and just plain good practices that help me manage the emailstorm. I've selected the best and put them into a jam-packed ebook that shows you how to write more effective and professional email, and how to deal with the mountains of email you receive (whether it's professional or not). People who ordered this item also ordered Where There's Smoke There's Email.Write only approving things about people, companies, organizations, countries, races, species and planets. Never criticize. You don't know where your message will go after it reaches your intended recipient. If you send your message early in the weekend to someone who's taking the weekend off, by Monday your message will be old — deep in the queue. Send it late in the weekend, or queue it for delayed delivery early Monday morning. When a message arrives with a high-priority tag, remember that the sender assigned the priority. The message is apparently high priority to the sender — but maybe not to you. When you write subject lines that start with the most general terms, subject sorts later on will group related messages together. For instance, choose "Alson account question" rather than "Question on Alson account." Think before you use "Out of the Office Autoreply"
This item is also available in 10-copy packs (USD 3.60 per copy), in 50-copy packs (USD 3.30 per copy), in 100-copy packs (USD 3.05 per copy) and in 500-copy packs (USD 2.45 per copy). 101 Tips for Writing and Managing Email is in Acrobat format, which gives you several advantages. You can print it, and read it like any book. Or in electronic form, you can use the search capability of Adobe Reader to find passages of special interest to you. If you load it onto your laptop, tablet, or other mobile device, you can read it anywhere — and it's weightless, too. 18 pages.